My husband and I love Costco. We were there not too long ago and bought a selection (or package, I should say) of various candy bars–Snickers, Twix, 3 Musketeers, oh my! I’ve buried them in my closet, so I wouldn’t be tempted to eat them all, but I recently just “rediscovered” them. Today was the perfect day to make candy bar cookies, as I was in the mood for a small dose of chocolate and hadn’t had a cookie in who knows when, but the hardest part I had was whether to use Snickers bars or Twix bars. I settled on the Twix, since they are more my weakness than Snickers. (Less in the pantry that way.) Such chocolatey, caramel goodness. In a food processor, scoop out 2 cups of oats. Blend them for about 30 seconds to 1 minute. The oats should be superfine, like all-purpose flour. Using a mixer, cream 1 cup butter, with a cup each of sugar and brown sugar. Mix long enough so it’s light and fluffy. Scrape down the bowl if necessary. Add 2 eggs and vanilla. Mix just enough so that there are no traces of egg. Chop up 3 Twix candy bars. FOLD that and 1 cup semi-sweet chocolate chips in the batter, and using a cookie scoop, place onto a cookie sheet. Bake, and then while they’re still warm, enjoy with a glass of milk. Life is good! Measure the oatmeal, then blend in a blender to a fine powder. In a bowl, whisk together the blended oatmeal, flour, salt, baking soda, and baking powder. Set aside. Cream the butter and sugars. Add eggs and vanilla. Mix until no traces of egg are left. Add dry ingredients to butter mixture. Mix well. Fold the chocolate chips and Twix pieces. 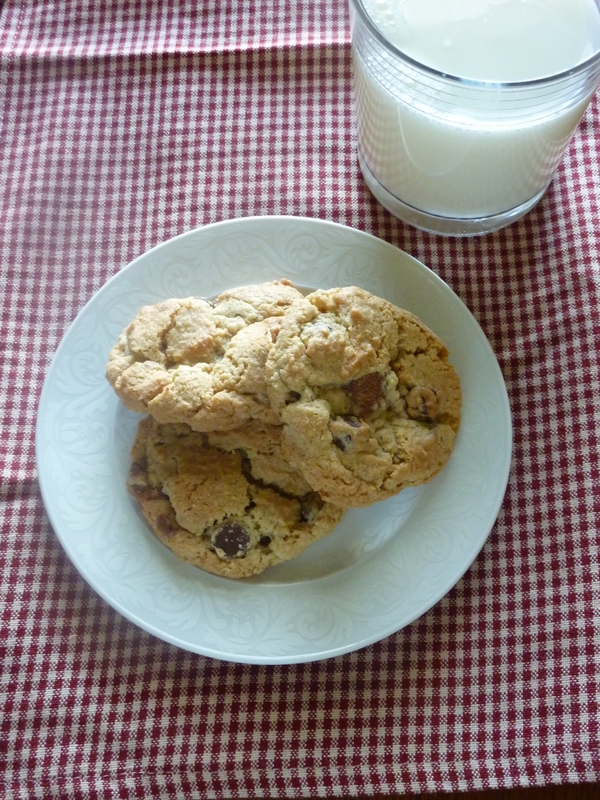 Drop by rounded spoonful on unreased cookie sheet. Bake for 10-12 minutes, or until edges are lightly browned. Perfect for a friends birthday this week. Wish I could eat these! Darn you holly!! !